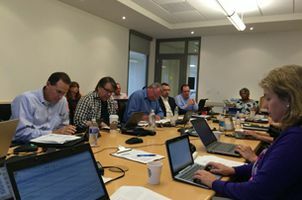 The Conditional Voter Registration (CVR) Subcommittee met in San Diego in late September to continue its work to determine how CVR would be implemented in conjunction with the statewide voter registration system, VoteCAL. Governor Brown signed AB 1525, which authorizes City Clerks to perform marriage ceremonies effective January 1, 2015. Prop 42 has a significant impact on Clerks of the Boards. John McKibben of Los Angeles County provides insights on its effects. CACEO and the County Recorders’ Association of California are holding the 2014 Joint New Law Workshop and Seminar from December 8-12, 2014 at the Hyatt Regency Hotel in Sacramento. Register by November 14th to get the early registration discount. Full details on CACEO's website - register today! Bill Shultz, Recorder-Clerk-Registrar of Voters of El Dorado County, knows first hand the devastation fire can bring to tinder dry country. Both El Dorado and Placer counties have been hardest hit, with the King fire covering 97,000 acres. Bill is also in charge of the county's Veteran's Affairs agency - he turned over the entire Veteran's Affairs' parking lot to the CalFire operations (shown in this photograph taken from Bill's office). CACEO extends its thoughts to all counties affected by the recent fires.